The nerve cell, and nervous systems, evolved in the sea, perhaps 700 million years ago or so. From there they ramified and are found in nearly all forms of animal life. I saw the orange brain above last week at Nelson Bay, Australia. 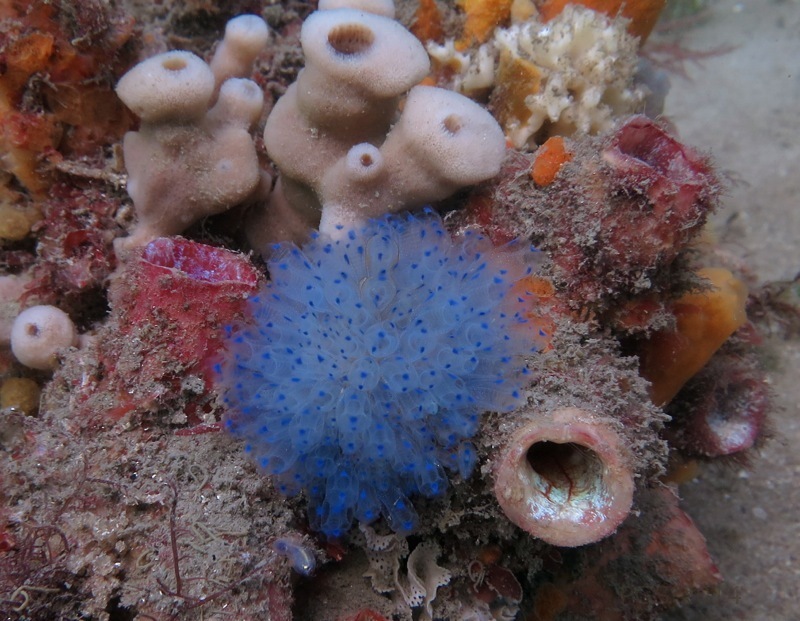 It’s taken me a while to work out what it is; initially I thought it might be a sponge or soft coral. 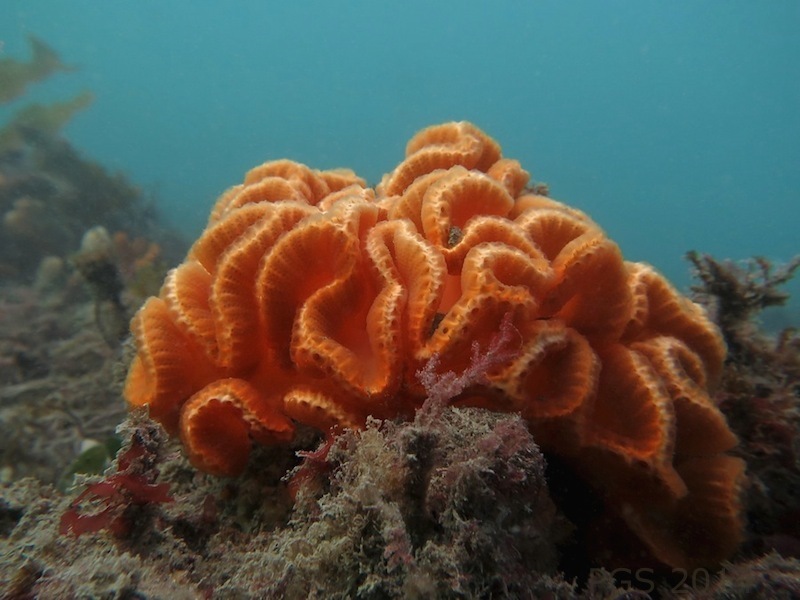 In fact it’s an “ascidian,” Sycozoa cerebriformis. Unlike sponges and corals, ascidians are quite closely related to us – they’re chordates, living over on our side of many of the deep-time branchings in the history of animal evolution.† A larger group they fall into, within the chordates, is the tunicates. A young ascidian swims about like a tadpole. Then it anchors to a surface, metamorphoses, and enters a life of filter-feeding. Some live alone, and some bud off more zooids to form a colony of connected and similar units. The brain-like object above is a colony of these smaller units, living partially fused in folded rows. [A]ccording to Llinás (2001), “the tadpole-like larva literally digests most of its own brain and reverts to the more primitive, sessile adult form of the species. The take-home lesson…is that a brain is necessary only for actively moving creatures.” In fact, adult ascidians have perfectly good brains, an order of magnitude larger than those of their larvae, and their behaviour is as finely adapted to sessility as that of the larvae to motility. 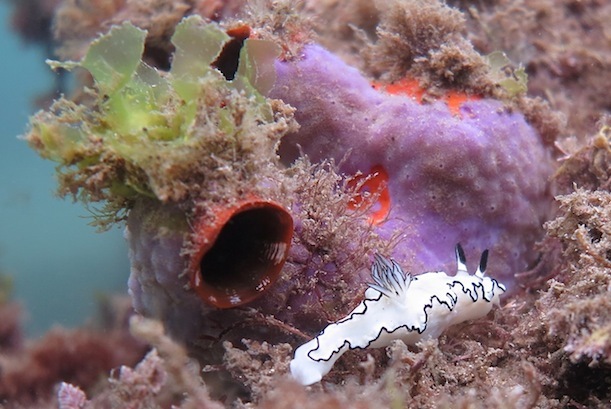 Ascidians have no eyes but can sense light. Some have specialized cells that “listen,” acutely, for vibrations in the water, and can detect vibrations about as accurately as salmon. Other parts of the ascidian nervous system follow paths of largely unknown function round the internal organs.‡ Some of the message here is one I am seeing in a lot of work in this area: how much of animal nervous systems are concerned with self-contained internal coordination of bodily activities, rather than responding to external events. Another part of the message is the sensitivity even motionless animals like this have to what goes on, listening as we pass. † Here’s a fragment of the tree of life, showing the location of tunicates and some other animals. †† I’ve not found much literature about Sycozoa cerebriformis itself. But here’s an extract from a larger study of this group. This entry was posted in Bodies and Minds, Nervous Systems. Bookmark the permalink. Amazing post as usual. I would always call things of this shape “brain coral” and I think I was only seeing dead versions of this “brain coral” anyhow. It’s neat to think that if I see that characteristic brain shape again underwater (at least, if it is a living version) that it may actually be an ascidian which is a chordate. That is blowing my mind. A chordate??? A cephalopod isn’t even a chordate!!! Someone needs to make a photo montage of all the different life stages and phenotypes of ascidians. I would hang it on my wall as art. 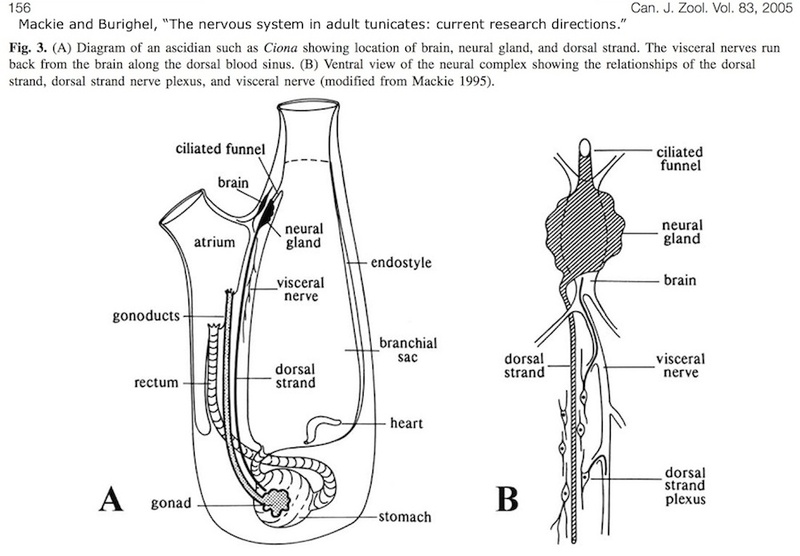 According to Mackie and Burighel, they’re doing quite a lot with their nervous systems. Lots of fine control of water flow, some control of heart rate, release of gametes, and other subtle management of internal processes. There are also several kinds of exhalation – more ungenerously called ‘squirting’. For all the emphasis on hidden complexity in Mackie and Burighel’s paper, though, ascidians do seem to lead a rather quiet life. OK. Vibration sensation ability could be supportive of the the following behavioral functions that you listed: control of water flow, release of gametes, exhalation/squirting. But what about light sensation? Could it rise to the level of “perception” (would they be sensitive to any lightness illusions, or are they literally living photometers)? And what would that be necessary for if you can coordinate with other ascidians via vibration sensation (e.g., all release gametes when the water flow conditions are right, etc)? I’m suspicious that all the most exciting secrets of the ascidians have been revealed, where their behavior/nervous systems are concerned. But again I know nothing about these little guys. I thought they were “brain coral” just yesterday for crying out loud.